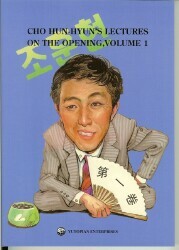 Cho Hun-hyun's Lectures on the Opening, Volume 1, written by Cho Hun-hyun, translated by Seong-June Kim?, published by Yutopian contains 218 pages with the ISBN 1-889887-60-0. You had better remember that if you have a two point extension inside the opponent's framework, your group is almost safe. Novices often make weak groups thinking that if they live, they have succeeded. They should learn to take the effect of White's walls or territory into account too. PeterHB: Good examples with plenty of explanations of incorrect moves. Positions have a clean feeling of having been chosen for their explanatory value, rather than the slightly less clear view provided by up-to-date examples of professional hand to hand fighting. Well written - a careful and clear translation to be proud of, with good spelling, grammar, and fluency. Intelligently laid out on good quality paper for easy reading. I look forward to future volumes in this series, though with more hope than expectation. There is no indication of work on translating the other volumes. Unfortunate, as there are only 41 problems in this volume, and I wish for many more at this quality. The value of a full set of one street in the board game monopoly is worth more than the individual properties. So often demonstrates examples of dual purpose moves. I would like more of the same. Often has six diagrams to thoroughly explain how a single poor play leads to a floating group under attack. This concentration on the consequences gives solid meaning to what can otherwise seems a difficult phase of the game. Clear reasoning replaces whimsical opening moves. If you ever have trouble interpreting the proverb 'urgent before big', then this is the book for you. Of value from 15k to 2d.